Anizet Koplin was born Adalbert in 1875 to a Polish-German couple in Germany and was the youngest of twelve children. On November 23, 1893, he joined the Capuchins and received the name, Anizet, meaning 'invincible'. He was ordained a priest in 1900 and focused on service to the poor. In 1918 he became a mediator between the many poor families living in misery and the very rich. Regarded as the 'Saint Francis of Warsaw', he could be seen walking the streets of Warsaw asking for charity for the poor. From the rich he asked for bread for the poor and from the poor he asked for prayers for the rich and for himself. On June 28, 1941, the day after the aerial attack on Warsaw, Anizet was arrested with twenty other brothers and shut in the prison of Pawiak, given the reason for his arrest as having read anti-National Socialist flyers and having expressed ideas against the new regime. He did not make use of his German descent in order to escape death. In addition to being stripped of their religious habits and their heads and beards shaved, the father guardian and brother Anizet were tortured to obtain forced confessions. Both refused to confess and Anizet remained faithful to his vocation. On September 3, 1941, all were loaded into a cattle truck and taken to Auschwitz where they were reduced to a prison number among thousands. Since Anizet was already sixty-six, he was assigned to the Invalids Block which was adjacent to those destined for extermination. On October 16, after a staged trial by jailers, they threw Anizet into a pit with other prisoners where they experienced a most cruel death by the corrosive acid, quicklime. Henry Krzystofik was born March 22, 1908 and was baptized Jozefon April 19, 1908. He donned the Capuchin habit August 14, 1927 and was ordained a priest July 30, 1933. Upon completing his studies, he was assigned to the friary of Lublin in Poland where he taught dogmatic theology at the local Capuchin seminary. Henry was then appointed rector of the seminary and vicar of the friary. He was later appointed Guardian and Rector, and once war broke out in 1939, the atmosphere became extremely tense. On January 25, 1940, the German Gestapo arrested him among the twenty Capuchins from the Lublin friary and transported them to Sachsenhausen concentration camp near Berlin. On December 14, 1940, he and his brothers were transferred to the concentration camp in Dachau where they received their prison numbers. In July 1941, he was weak from exhaustion and unable to walk so he was assigned to the camp hospital, which was the same as a death sentence. From the hospital he got a secret message out to his clerics, "I am terribly thin... I weigh 35 kilos. All my bones are painful. I am lying in bed as in the cross with Christ. I am glad to be with Him and suffer with Him. I am praying for you and offer my sufferings to God for you." He died August 4, 1942 and was cremated in ovens of camp twelve. Florian Stepniak was born January 3, 1912 in Zdzary and professed a Capuchin priest June 24, 1938. He was a man of singular faith and kindness. He lived in the friary in Lublin and was arrested on January 25, 1940. He was later deported to Dachau and in moments of uncertainty and terror, he sustained the spirit of his fellow prisoners, earning the name, 'spiritual father' of the block of the condemned and 'sun of the camp'. On August 12, 1942, he was removed from the camp into the 'division of the invalids' and killed in the gas chamber. Fidelis Chojnacki was born Hieronim on November 1, 1906 in Lodz, the last of seven children. At home he received an exemplary religious education, attending the parish of Holy Cross. On finishing school, he enrolled in the military academy, after which he worked for a year at the Department of Social Security and then at the Warsaw Central Post Office. He was a reliable employee. Meanwhile, he worked in the organization of Catholic Action with his uncle Father Stanislaw Sprusinski, where he was engaged in a campaign against alcohol and became aware of the need to deepen his interior life. 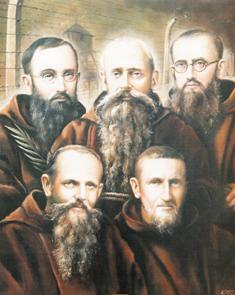 On August 27, 1933 he received the Capuchin habit and the name Fidelis. He was in his third year of theology studies when he was arrested and jailed for five months in Lublin Castle. On June 18, 1940, he was transferred with the whole group to the concentration camp at Sachsenhausen near Berlin. On December 14, 1940, he was transferred in a convoy of priests and religious to the concentration camp of Dachau where his arm was tattooed with his prison number. In the summer of 1942, Fidelis was transferred to the invalid block, but before leaving, he kissed and greeted his brothers with the words of Saint Francis, "May Jesus Christ be praised. We will meet again in heaven." On July 9, 1942, Fidelis died in the camp hospital and his body was cremated. Symforian Ducki was born Feliks on May 10, 1888 in Varsavia. He joined the Capuchins in 1918, first as an inquirer, making himself useful in the reorganization of the friary. He made his solemn profession on May 22, 1925. In Warsaw he first had the role of brother questor, busy with the collection of donations for the construction of the minor seminary of Saint Fidelis. Then for a number of years he was appointed socius of the Provincial minister. He was a simple and friendly character who never lost the spirit of prayer and devotion. He was arrested June 27, 1941, along with twenty two Capuchins in the Warsaw friary. At first Symforian was interned in Pawiak and then transferred to the extermination camp of Auschwitz, where he was beaten to death on April 11, 1942, by the guards after making the Sign of the Cross over the bodies of slaughtered prisoners. On June 13, 1999, Pope John Paul II beatified 108 martyrs of Poland in the last World War. Among them were 3 bishops, 52 diocesan priests, 26 religious priests, 3 cleric, 7 lay religious, 8 female religious, and 9 laity. God our Father, you were pleased to adorn Blesseds Anizet, Henry, Florian, Fidelis and Symforian with the palm of martyrdom. They burned with love for you in propagating the faith. Through their prayers grant that we may be firmly rooted in love and merit to experience with them the power of Christ’s resurrection. We ask this through our Lord Jesus Christ, your Son, who lives and reigns with you and the Holy Spirit, one God, for ever and ever.